David Beckham to Appear on "The View"
David Beckham will join the ladies of "The View" as a guest on Monday. ABC says it will be the first time the soccer superstar has appeared on the weekday talk show. The network made the announcement Wednesday. 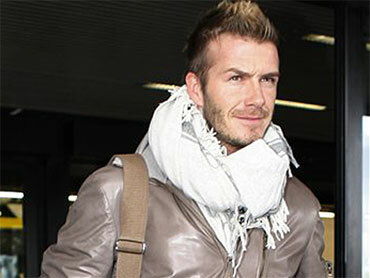 Beckham will follow by two months a February co-host appearance by his wife, singer-model-businesswoman Victoria Beckham. The 34-year-old midfielder is recovering from a torn Achilles tendon. He was hurt playing for the AC Milan while on loan from the Los Angeles Galaxy. "The View" features hosts Barbara Walters, Whoopi Goldberg, Joy Behar, Elisabeth Hasselbeck and Sherri Shepherd. It airs at 11 a.m. Eastern time.